Can’t say enough to the most amazing 80’s cover band in the land!!!! You guys were on cue from the first song right down to the last line on the last song. Thanks for letting us rock with you as we brought the roof down at the Kolo Klub in Hoboken NJ last night. Thanks again JC Keys. The Band was so amazing! They really were wonderful. Everyone Loved Them and the party was a huge success! They were all really nice too! Best nite of my summer thus far! Fun, friendly sing along dance party!!!! Loved them. Wow! White Wedding blew the doors (if we had doors) off the place last night for one of the biggest & best crowds we've ever had. Thanks for kicking it back to the 1980s with us. You guys are awesome. Same time next week? Maxxtone will be hitting the stage for another dance party/food truck festival/singalong/picnic-extravaganza. Everyone loved the band, all ages up and dancing and had a great time. Band was playing in 90+ degree heat, and didn’t (at least show it) phase them. Would highly recommend!! White Wedding band was easy to communicate with before the event, and they made sure to understand the event to best tailor their performance to us. They performed for college students, and everyone loved their song selections and their talent as a group. They engaged the crowd and everyone had a great time! They were easy to work with the day of the event as well and always asked how they could best serve our needs throughout. Simply the best !!!!!!! Everyone loved the band !!!!!!! I will hire them again !!!! The White Wedding Band topped all of our expectations! Flawless does not even cut it!!! They took our party to the next level and really made it the blast that our guests will remember forever! They took all of the classic 80s songs and added their own magnificent twists to it. They encouraged the party to sing along and brought the energy up with every number they performed. The coolest part of their performance was the costume changes! Every few songs the band mates would rotate and get into the 80s character with a change of clothing! Each costume change was in theme and all were AWESOME. If I’m being honest, they were MUCH better than the promo vids and really deserve to be recognized. We had a decades themed party for our event, and they were the perfect addition, but we will be hiring them for ALL our events, no matter what, in the future!! Thank you White Wedding band for Dancing Through the Decades with us and turning back time with the BEST 80s performances. We had hired the White Wedding Band for my 40th birthday. They are amazing musicians and entertainers. I really enjoyed the music and danced all night. Our guests kept asking where we found the band!! They made the night! Turnout. I'd totally be down to do it again! Thank you! White Wedding was amazing. Everyone had the best Time! Absolutely fantastic time. Everyone had a blast and "White Wedding" certainly delivered. It was fun & always impressive to see a good crowd dancing for the whole night. A real "singing with your eyes closed" kind of party. Looking forward to working with them again next year in 2017! Sunday. You guys did an amazing Job! JC was very helpful throughout the whole process and communicated to us what was happening. The music on the actual wedding was great and everyone had a BLAST! Dealing with this band was a dream. They wee so professional and sounded like I was playing the radio back in 1985 Best night ever!!! just want to Thank you for an amazing 80s night at the camp. Everyone had a great time and asked me for your contact. Hopefully will see you guys again soon! Hey JC. Thank you to you - and the crew - for making Saturday night so much fun! You guys did a great job and we had a blast. Thanks also for allowing this middle-aged woman from the suburbs to sing with the band. It was way more fun than singing into the wooden spoon in my kitchen. We def should have turned my mic off though! Awesome just awesome!! I had the best time and day of my life! Thanks white wedding you guys were unreal and so much fun! I didn't want the night to end we are still running around singing 80's songs! Thank you for making our wedding day one of the best days of our lives! You guys ROCK! Working with you throughout the planning process made everything so easy and stress free. We can't thank you enough for putting so much positive energy and excitement into our wedding. All our guests can't stop raving about how talented you are all! And quite a few are looking to book you for their next party! We're so happy to have had you as our wedding band. Thank you again and hoping to rock out with you guys in the future! You guys were absolutely amazing, everyone was still talking about how great you all were this morning! We can't thank you enough, and can't wait to see you guys again soon! Just wanted to thank you and the rest of the band for an absolutely incredible evening. You guys brought the house down. I can't tell you how many emails we've gotten about your performance. Staff had to stay later cause they forgot they were working and were just watching White Wedding! What a night. Can't wait to see you guys perform again. Thank you so much for playing at Andy's 40th Bday party. Your Band really brought the party to life. It kept it going all night long. We loved the music, costumes and the entire performance. The event was a smashing success and really, really, thanks to you guys. White Wedding was exactly the right band for our inaugural ‘80s Prom, “Love Hurts.” Please extend our appreciation to everyone in the band. You go all out – from costumes to song choice to killing it musically. And, even though the weather was a challenge, we had such a nice crowd. They all had a blast! I hired White Wedding for my wife's surprise b'day party. From the start to finish, dealing with the band was smooth and professional. They responded back to my gig masters request within hours, explained their quote in detail and the contract process was smooth. The day of the event, the band was on time, setup with no issues and most importantly, they show was amazing. Guests had a wonderful time with various inquiries about the band. i would recommend and hire the band without any reservations. Thanks a lot guys! Thanks again to you and the band for playing our wedding celebration. JC, Rob, Diana, Logan, Eric & Greg, I profusely thank you for making Lauren's 40th birthday party so rad and rocking! The guest-of-honor, along with guests of all ages, thoroughly enjoyed your skilled performance. In true 80's fashion, it was a totally awesome time! Thank you again for the great and memorable performance, and for also being the perfect combination of fun, friendly, talented and professional. I will gladly recommend White Wedding and eagerly look forward to seeing you play again soon! THANKS A MILLION for the awesome birthday bash Sat nite at the Tiki Bar! The Crew and I had so much fun with you guys as usual...and the ones who were away & couldn't make it wished they were there. It was so very generous and thoughtful of you to present me with the beautiful Roxxoflove bracelet! Whenever I wear one I think of you and how much fun I've had! Hey guys – I just wanted to thank you for putting on such a great show, you had the crowd dancing all night. Debbie couldn’t believe that White Wedding was playing at her party. When we saw you guys last summer in Freeport I knew I had to see if you could do her party and what a great choice you were. You guys really made the night, all of my friends have been raving about the band and what a great party it was. Thanks again for making my wife’s 50th birthday party that much more special. More than 360 people showed up for the West School Fundraiser at the Sands Atlantic Beach on Friday, Feb. 22. The event, organized by Rhonda Healy and Christina Kile, raised more than $20,000 for the West School music and arts departments. The ’80s cover band White Wedding kept the crowd dancing all night, and many dusted off their favorite retro outfits and dressed for the occasion. Artist Chuck Close also stopped by to show his support. The event was sponsored by Friends of the Arts and Friends of the Long Beach NY School District. Thanks for a great night! My 40th birthday could not have been any better. I lost track of how many times people told me that "the band is awesome"!! Your singers are fantastic, and the vibe that the band sets off is electrifying. TOTALLY 80's!! I'm still receiving messages about how much fun everyone had. One statement was "it was an epic night". Coming from a person who plans parties on a regular basis, this was BY FAR the most fun I've had!! Your band was extremely professional and SOOO easy to work with. One of the best parts was that you accommodated me with my special requests, which were awesome by the way! The White Wedding Band played at my birthday party this June. They were the first band I have ever hired and it turned out to be a wonderful experience. They are professional, easy to get in contact with and always returned my calls in a timely manner. The night of the party they arrived early, set up quickly and then put on a great show all night. They are a very talented group of musicians/singers and over all a nice group of people. My guests were dancing all night and just raved about how well they performed. I highly recommend them for any party, event or wedding. You will not be disappointed! White Wedding was awesome. They set up in a small, slightly challenging space and made work like complete pros. Prior to the gig they were very communicative and easy to work with. More importantly I cannot say enough about how much fun this band is, the crowd went crazy for them and we had an amazing time. Their costume changes and ability to perform so many 80s hits so well make the experience just the best. I would hire them again in a heartbeat. Thank you so much for an amazing party. You guys were phenomenal! All of our friends have been talking about how much fun they had and how incredible you guys were. Every song was amazing. Your costumes were so great. We didn't want it to end. The party was beyond my expectations: the amazing outfits my friends wore and how wild and crazy everyone got on the dance floor. We would highly recommendWhite Wedding; feel free to use us as a reference. Please pass this note along to the rest of the band. Thanks again for making it a totally awesome rockin' 80s party that we will remember forever. White Wedding performed at our wedding. From the first time we saw the band, we knew they would be the perfect band to play in our wedding. They were really easy to work with and played songs that we specifically requested for our first dance. Everyone at our wedding loved the band and our dance floor was never empty. They worked with the song list, schedule and even some extra songs we wanted to hear that night. They helped make our wedding very special. If you want a band that everyone will be talking about weeks after your special event, I would strongly suggest White Wedding. Great band, perfect 80s party. We hosted a 30th bday party for 150ppl with White Wedding. Their performance was amazing: Costumes, stage decor, party prizes, learned new songs at our request, worked with the venue sound coordinator. Our crowd never left the dance floor all night. Perfect performance. Thanks White Wedding! We'll do it again soon! White Wedding performed for my husband's bday party and was no doubt the highlight of the party. 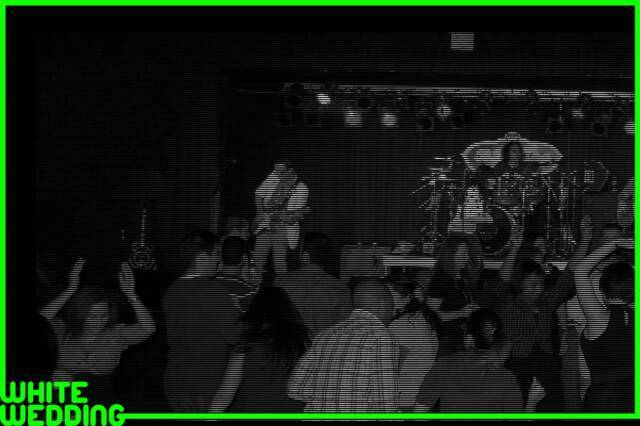 Our guests could not stop raving about how much they loved the band! From my first interactions with White Wedding, through all the planning, until the very end, they were such a professional group and so great to work with. I'd suggest if you are even considering using White Wedding, that you ABSOLUTELY make them your choice. You will be so happy you did! All of our friends and family can't stop talking about how amazing you guys were. White Wedding was the best decision we made for our wedding, besides picking each other of course. You sounded amazing, kept everyone dancing all night, and just generally contributed to the best party of our lives. We're already thinking about occasions (excuses) to have you perform at future birthdays and anniversaries!